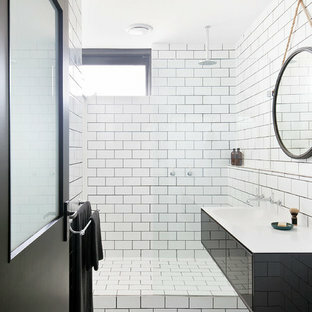 Photo of a modern bathroom in Other with a shower/bathtub combo, black and white tile, white walls, an integrated sink and black floor. 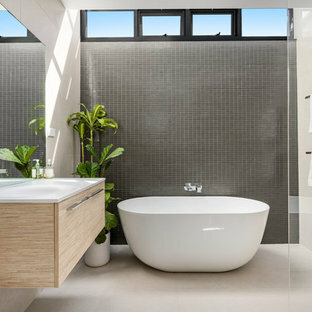 Photo of a contemporary master bathroom in Sydney with flat-panel cabinets, beige cabinets, a freestanding tub, a corner shower, a one-piece toilet, gray tile, cement tile, grey walls, an integrated sink and grey floor. Inspiration for a small contemporary master bathroom in Melbourne with black cabinets, an open shower, subway tile, white walls, ceramic floors, white tile, a wall-mount sink, laminate benchtops and flat-panel cabinets. Mid-sized contemporary master bathroom in Sydney with flat-panel cabinets, black cabinets, a wall-mount toilet, gray tile, ceramic tile, multi-coloured walls, ceramic floors, an undermount sink and granite benchtops. 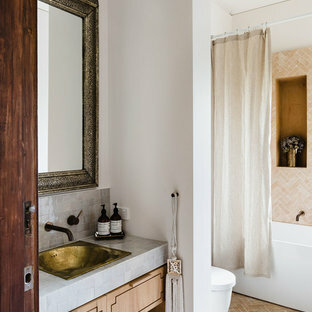 Photo of a mediterranean 3/4 bathroom in Melbourne with flat-panel cabinets, light wood cabinets, an alcove tub, a shower/bathtub combo, a one-piece toilet, beige tile, beige walls, a drop-in sink and grey floor. 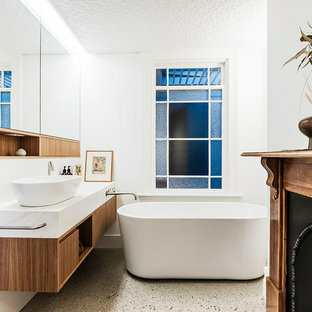 Photo of a contemporary 3/4 bathroom in Sydney with flat-panel cabinets, light wood cabinets, a curbless shower, white tile, white walls, a vessel sink and white floor. 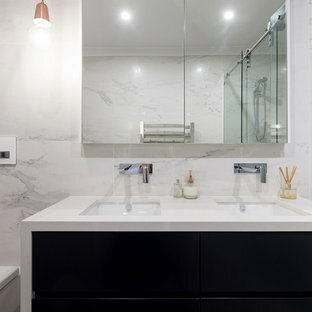 This is an example of a contemporary powder room in Sydney with flat-panel cabinets, medium wood cabinets, white walls, a console sink and grey floor. Design ideas for a contemporary kids bathroom in Brisbane with flat-panel cabinets, medium wood cabinets, a freestanding tub, gray tile, white tile, grey walls, a vessel sink and grey floor. 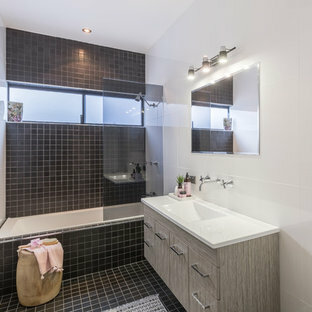 This is an example of a midcentury 3/4 bathroom in Melbourne with flat-panel cabinets, grey cabinets, a drop-in tub, a curbless shower, white tile, white walls, mosaic tile floors, an undermount sink and black floor. 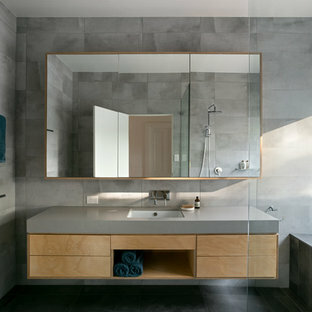 This is an example of a contemporary bathroom in Melbourne with black cabinets, cement tile, grey walls, cement tiles, a vessel sink, laminate benchtops, grey floor, flat-panel cabinets and gray tile. 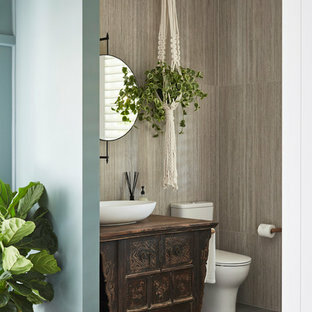 Design ideas for a mid-sized contemporary 3/4 bathroom in Melbourne with flat-panel cabinets, medium wood cabinets, a curbless shower, a wall-mount toilet, gray tile, a vessel sink, wood benchtops and grey floor. This is an example of a small beach style kids bathroom in Other with light wood cabinets, a corner shower, white tile, mosaic tile, white walls, porcelain floors, a vessel sink, engineered quartz benchtops, grey floor and flat-panel cabinets. 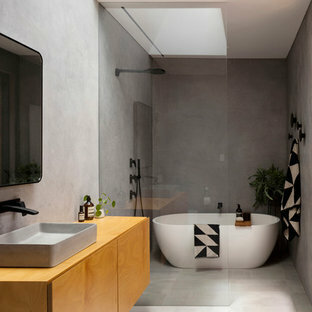 Design ideas for a mid-sized contemporary bathroom in Melbourne with open cabinets, a freestanding tub, white tile, glass tile, mosaic tile floors, a vessel sink, solid surface benchtops, light wood cabinets, white walls and white floor.